The following is the editorial introduction to the most recent issue of the Bulletin for the Study of Religion (43.1, February 2014). We offer this introduction here in order to give readers of the Bulletin’s blog a sense of what is coming out in the Bulletin. For the Table of Contents of this issue, see our earlier entry. In every discipline a seminal work arises that reshapes the intellectual map of future scholarship. Thomas Kuhn, in his classic The Structure of Scientific Revolutions, designated such moments as paradigm shifts. Such shifts arise when previous paradigms cease to serve their problem-solving function, when past solutions are seen as deficient or even problematic. In 1993 just such a work was published within the field of religious studies, though it was certainly not the only voice raising such concerns. Twenty years after Talal Asad’s Genealogies of Religion, our discipline has become accustomed to problematizing the category “religion” with such terms as “discourse” and “genealogy.” No longer is the category treated as a benign designator, at least among the theoretically sensitive. Increasingly, scholars are appreciating the taxon as a politically and culturally embedded product. The term “religion” (like all language) is now recognized as a expression of power relations. This issue of the Bulletin brings together a set of papers marking the twentieth anniversary of Genealogies of Religion. Both Richard Amesbury and Robert Orsi raise critiques—positive and negative—of Asad’s work, or, more accurately, of scholarly use of his work. Each challenges us to assess anew Asad’s insights. Whether we are engaging political uses of religion, such as in the secular-religion dichotomy so common in modern discourse, or we are reconsidering the object-subject relationships in our critical analyses, Orsi and Amesbury push us to not simply sit comfortably with Genealogies of Religion, but to look beyond this work with its insights in view. Bringing the discussion to a close, we have an interview between Craig Martin and Talal Asad. Here Asad offers his own reflections on Genealogies of Religion, giving us a glimpse into his own role as “first reader” (to borrow from Paul Ricoeur). It is my hope that through these papers readers will be able to not only appreciate Asad’s contribution to the field, but will also build on that contribution so that we may have an even more grounded, theoretical discipline taking shape as we continue our own particular research and teaching endeavors. The other articles in this issue offer further insights into the study of religion. Matt Sheedy shares his fieldwork with the Winnipeg Occupy Movement. Sheedy elucidates the discursive processes of social formation within the Occupy Movement, where myths, ritual, and symbols serve as (continually changing) building blocks for participants in the movement. Robert Segal, a well-known voice in the history of method and theory, explores the problematic relationship of interpretation and explanation within the work of Weber, Geertz, and Ricoeur. Donovan Shaefer’s analysis of the recent film 12 Years a Slave grants us a glimpse into the role of religious discourse within popular media venues, in particular with an eye toward the intersection of race and religion. 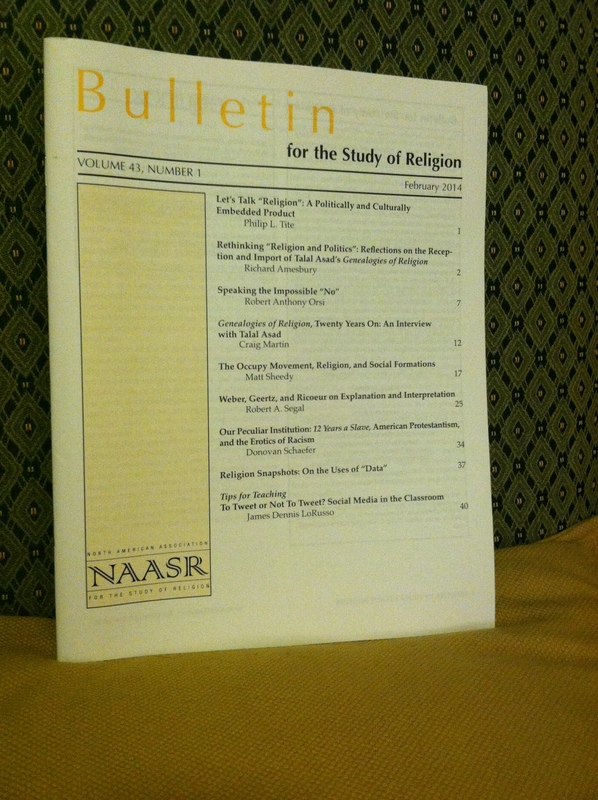 This issue of the Bulletin also offers a roundtable on the use of “data” (as constructed category) within the study of religion. “Religion Snapshots” is a new feature on the Bulletin’s blog, where a group of scholars are invited to respond to a theoretical question in the discipline. We are pleased to include this particular roundtable here in the Bulletin. I encourage readers to follow our blog, where further “Snapshots” have been posted on a range of topics. Finally, James Dennis LoRusso’s contribution to our teaching series, “Tips for Teaching,” tackles the increasing impact of the digital age upon our classrooms. As always, we welcome submissions from our colleagues on their classroom experiences for the Bulletin. This entry was posted in Academy, Announcements, Editorial, Philip L. Tite, Politics and Religion, Religion and Popular Culture, Religion and Society, Religion and Theory, Religion Snapshots, Theory and Method, Theory in the Real World and tagged 12 years a slave, Bulletin for the Study of Religion, Clifford Geertz, Craig Martin, Data, Donovan Shaefer, Educational Technology, Genealogies of Religion, James Dennis LoRusso, Matt Sheedy, Max Weber, Occupy Movement, Paul Ricoeur, Religion, religious studies, Richard Amesbury, Robert A. Segal, Robert Orsi, Robert Segal, scholarship, Sociology of Religion, Talal Asad. Bookmark the permalink.